There is ONLY one REAL Rat Pack Experience! It’s not until you indulge in Hackett Miller’s critically acclaimed production, presented by Titan Productions. that you begin to realize why “Sandy Hackett’s Rat Pack Show” is the Presenter’s Choice for the finest performing arts centers across the country. Have their own personal connection to these iconic legends has allowed the producers to tell this story like no one else can. Sandy Hackett’s father, legendary comedian, Buddy Hackett was great friends with Frank Sinatra, Dean Martin, Sammy Davis Jr. and Joey Bishop – and together, they all made history. Sandy Hackett was Joey Bishop’s only choice to portray him in any production involving the legendary Rat pack. 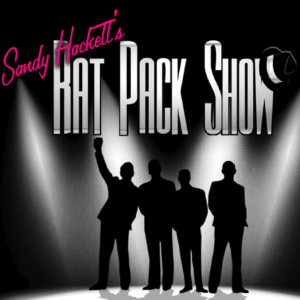 Sandy Hackett along with Titan Productions, brings the Rat Pack to life, highlighting those magical moments in time. Now audiences can experience this critically acclaimed, hugely entertaining theatrical production which includes exciting new arrangements of classic songs and original, never-before-heard songs written by the late, best-selling songwriter, Ron Miller, along with recorded voiceovers made exclusively for this show by the late, comedic genius, Buddy Hackett.